TOKYO, April 9 (Xinhua) -- A symposium for China's Guangdong-Hong Kong-Macao Greater Bay Area was held here Tuesday to introduce the Greater Bay Area and seek cooperation in developing the area between China and Japan. The event, jointly held by Guangdong Province, the Hong Kong Special Administrative Region (HKSAR) and the Macao Special Administrative Region (Macao SAR), was attended by more than 1,000 people from political and business sectors of the two countries. While delivering an opening speech at the event, Chinese Ambassador to Japan Cheng Yonghua said the Greater Bay Area is a new attempt made by China to forge a new pattern of comprehensive development in the new era. He hopes that through the event, participants will learn more about Guangdong Province, the HKSAR and the the Macao SAR as well as the Greater Bay Area. Noting that Guangdong Province and Japan share close economic and trade cooperation, Guangdong Governor Ma Xingrui called for enhanced cooperation and exchanges between the Greater Bay Area and Japan in such areas as manufacturing, science and innovation, transport, and people's livelihood. 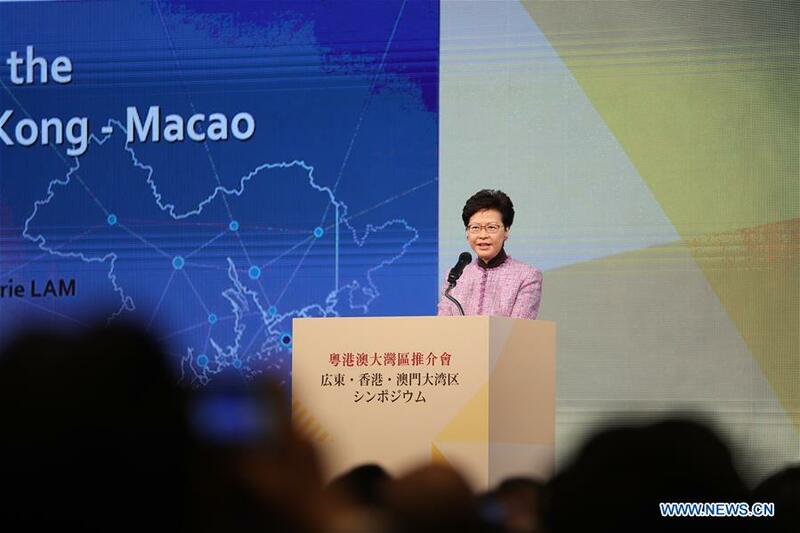 HKSAR Chief Executive Carrie Lam made a detailed introduction of the Greater Bay Area and Hong Kong's role in the area, and she called on Japanese companies to seize the business opportunities brought by the Greater Bay Area. Sonia Chan, Macao's Secretary for Administration and Justice, said that Macao is one of the "central cities" in the Greater Bay Area, and also an important juncture of the 21st Century Maritime Silk Road. Speaking highly of the Greater Bay Area's economic achievements and its openness, Yoshihiro Seki, Japan's state minister of economy, trade and industry, said Japan and the Greater Bay Area have close economic connection and the development of the Greater Bay Area is a great opportunity for Japanese enterprises. After the symposium, a panel discussion of development and cooperation opportunities was also held. The Greater Bay Area consists of the Hong Kong Special Administrative Region, the Macao Special Administrative Region, as well as nine cities in Guangdong Province -- Guangzhou, Shenzhen, Zhuhai, Foshan, Huizhou, Dongguan, Zhongshan, Jiangmen and Zhaoqing. Covering a total area of 56,000 square kilometers, the bay area had a combined population of about 70 million at the end of 2017 and its gross domestic product reached around 10 trillion yuan (1.48 trillion U.S. dollars) in 2017.